Fill out a style “profile” – takes about 10 minutes, asks not only your body type and sizing, but also asks you to describe your style. It also shows you pictures of outfits that you then like or dislike. 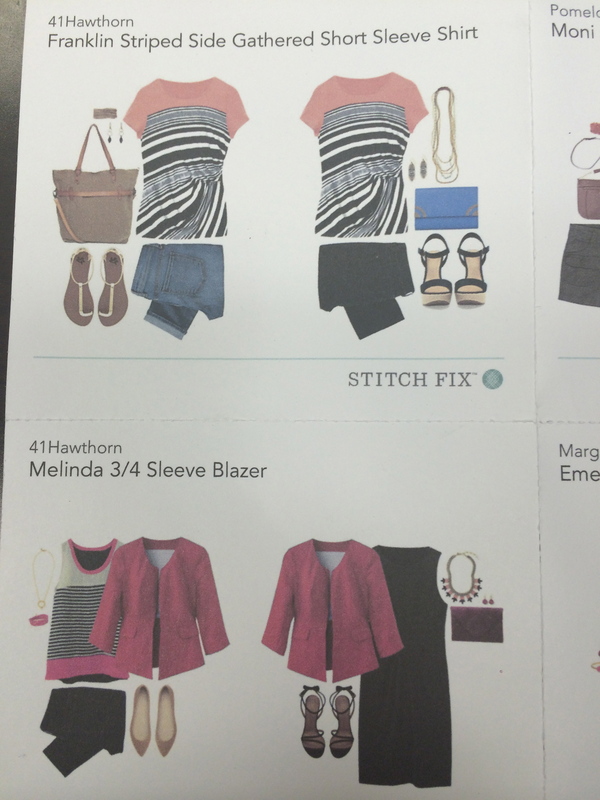 Sign up for a “fix” – There is $20 styling fee that goes towards your purchase, and you receive 5 items in the mail. Try everything on at home and any unwanted items are returned in the included (postage already paid) bag within 3 business days. If you keep all 5 items, everything is then discounted 25%. Neither one of these dresses is my usual style, but they both fit well, were comfortable and church appropriate. Pretty much your basic dark denim skinny jeans. 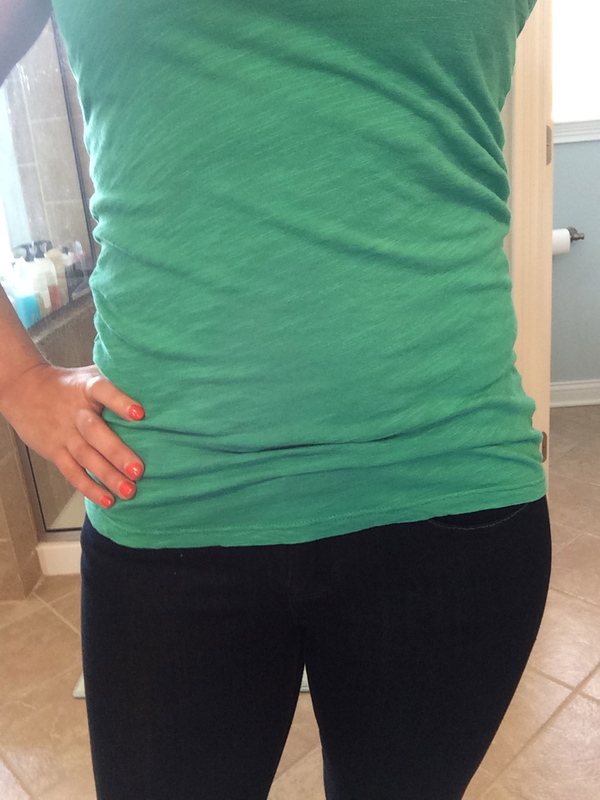 They are a nice basic, comfortable and didn’t create the dreaded muffin top so I kept them. Probably the best part was that since they were “ankle length”, they were the perfect full length on me, and I didn’t have to hem them! 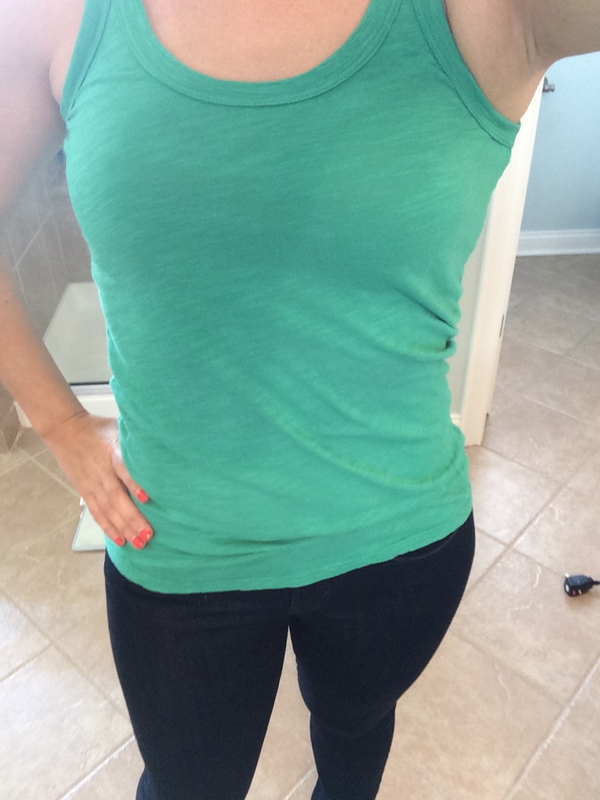 The short sleeve shirt was okay, I liked the color but the fit was a just bit blah for me. The Cross-Front Blouse was just flat out not flattering, and I wasn’t really into long sleeve shirts heading into summer. 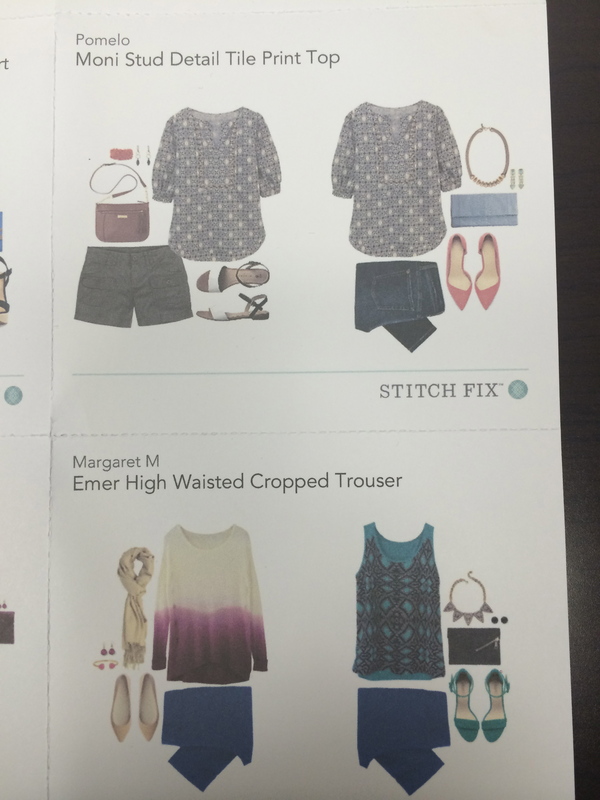 Overall Impression of Fix #1: Very conservative clothing, overall probably a safe bet from the stylist’s perspective. 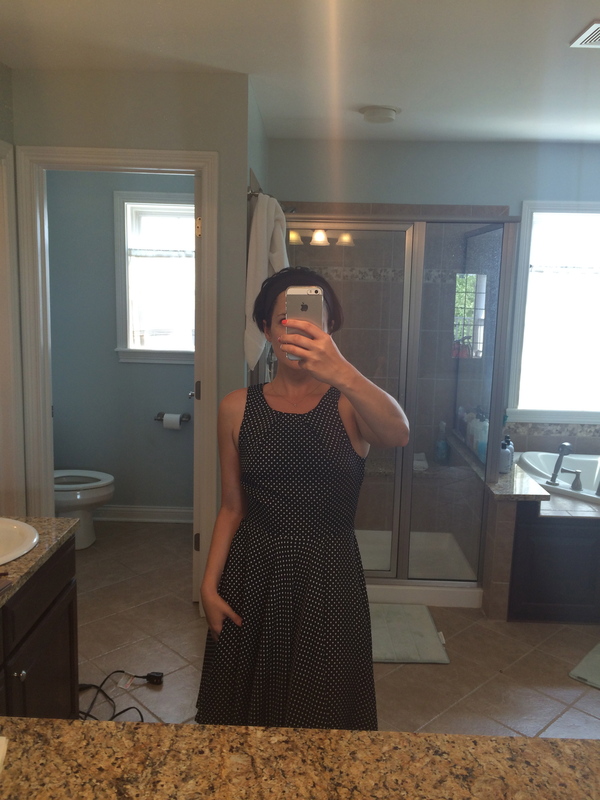 I wasn’t crazy about either of the dresses, but I did need some items that I could wear to church. Sometimes my husband thinks my fashion choices are a bit “much” for church, but whatever, I think anyone would enjoy the fabulous leather skirt I wore one Sunday. Anyways… Seeing as how my style icon is Olivia Palermo, I knew I was going to have to put some work into this. So I gave tons of feedback, requested no more super conservative dresses and started a Pinterest page. 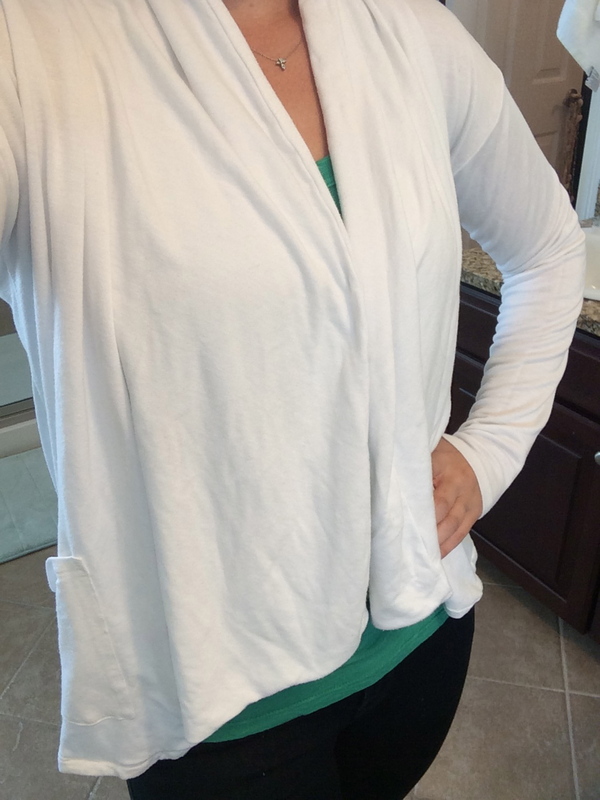 A very nice open cardigan, great fabric and I have worn this a ton since getting it. 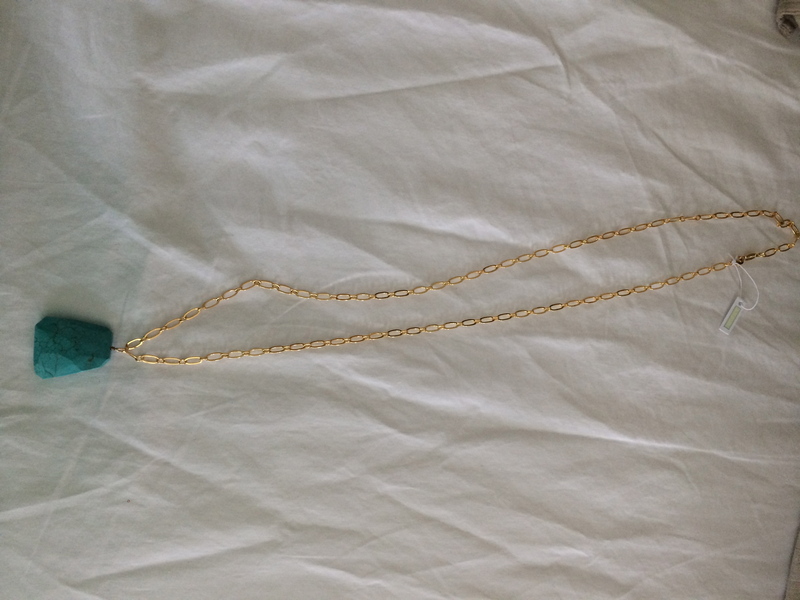 Pixley Denali Layered Chain Necklace – unfortunately I don’t have a picture of this, but think of 3 very bright gold very thick chains all the same length but in one necklace. It wasn’t really “layered”, and the gold looked terribly cheap. 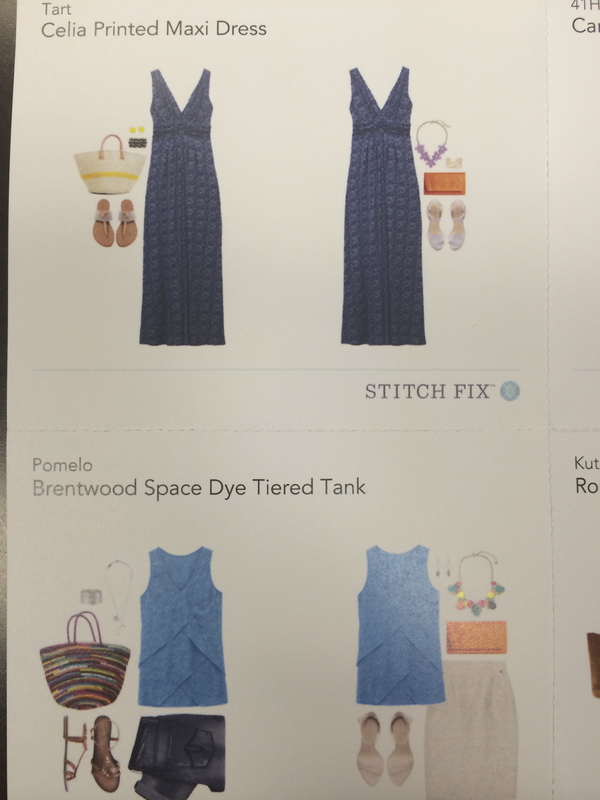 Overall Impression of Fix #3: A blazer, trousers, and a long sleeve dress are considered fun summer clothing? I really didn’t think they could have been more off… All of the clothing went back into the bag this time. The short sleeve shirt was super unflattering and I’m guessing the “studded” 3/4 length sleeve blouse was their answer to my asking for more modern, less conservative clothing? So, I figured it was time for an intervention. 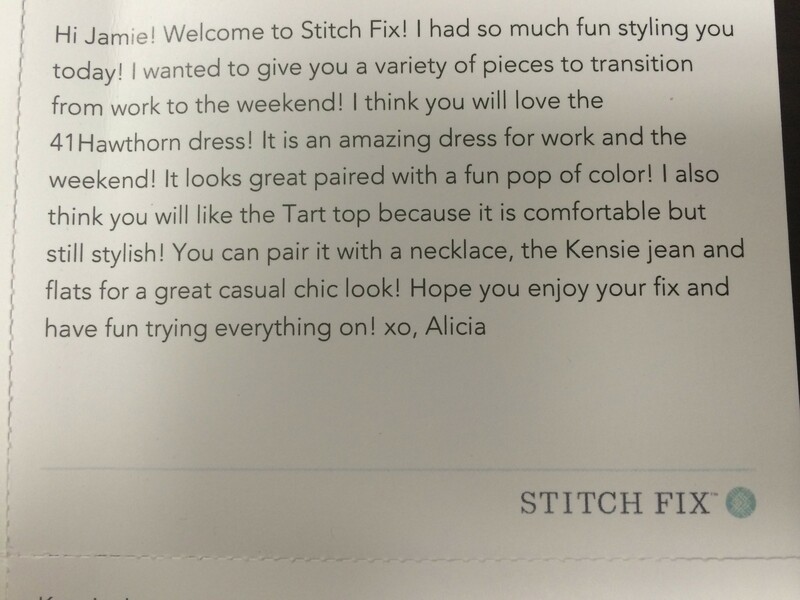 I emailed Stitch Fix, who reviewed my Pinterest page, my notes, and the latest fix and agreed with me that they were missing the mark… by a lot. I will say they truly had great customer service, refunded my $20 styling fee and got me yet again, another stylist. 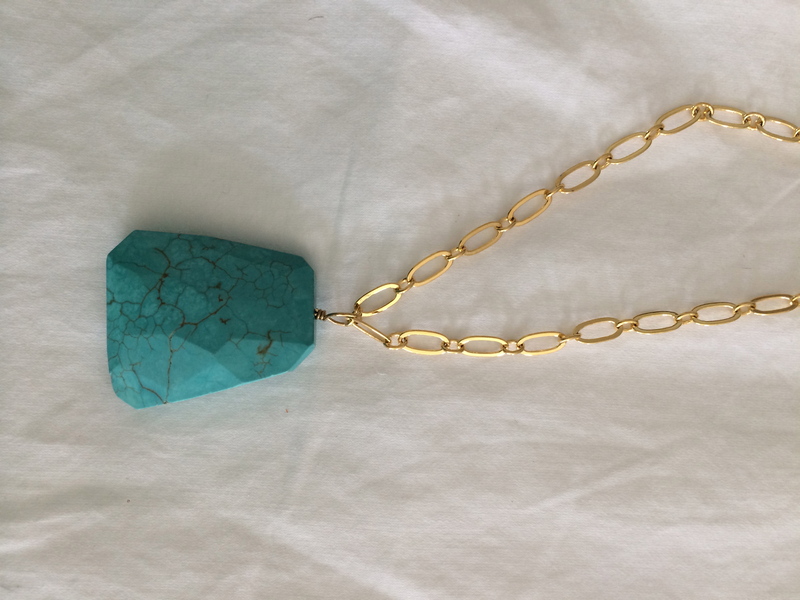 This necklace was definitely “statement” without being overstated and had a nice weight to it. 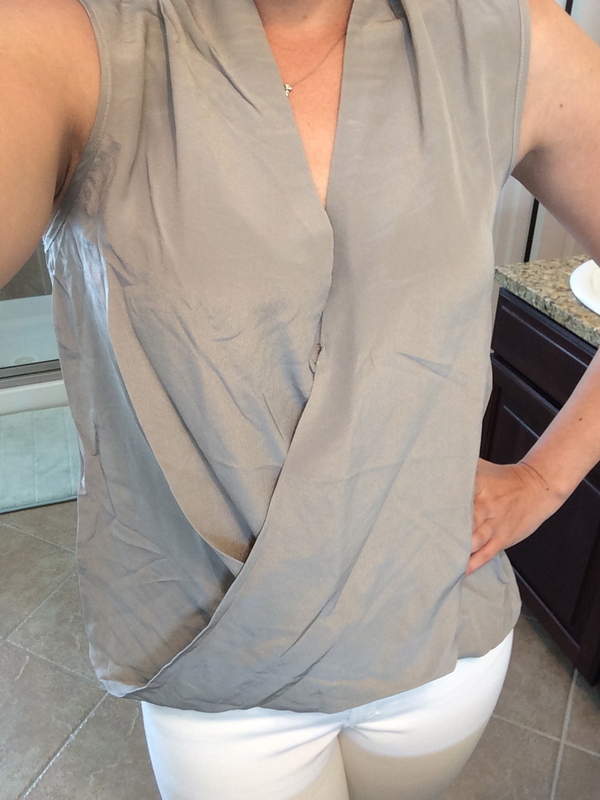 Even though this is a loosely fitted top, it is modern looking as well as comfortable. The silk material is nice and will be perfect for summer. The jeans were great – not really a boyfriend cut, more like a skinny boyfriend I would say. But, I already own white jeans (J. Crew Toothpick, which I love) and didn’t need another pair. 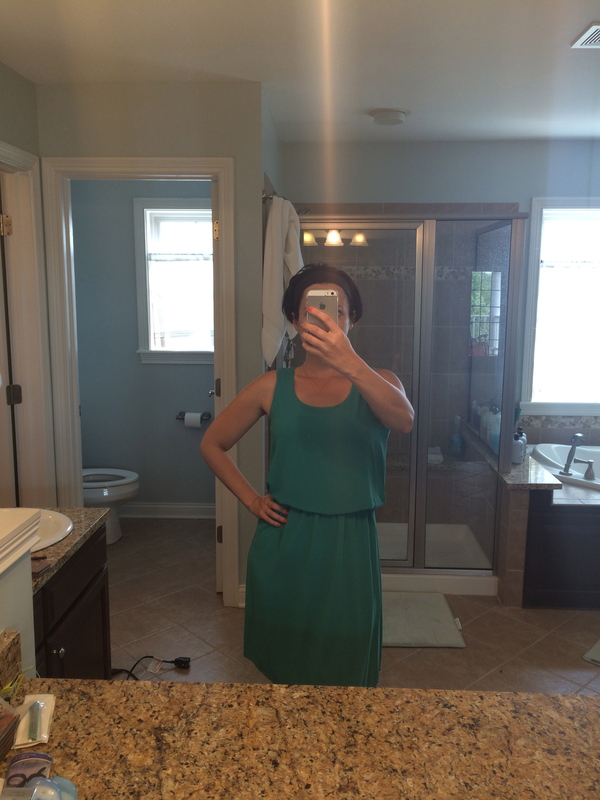 The maxi dress was made of a great fabric, but needed at least 6 inches hemmed from it. 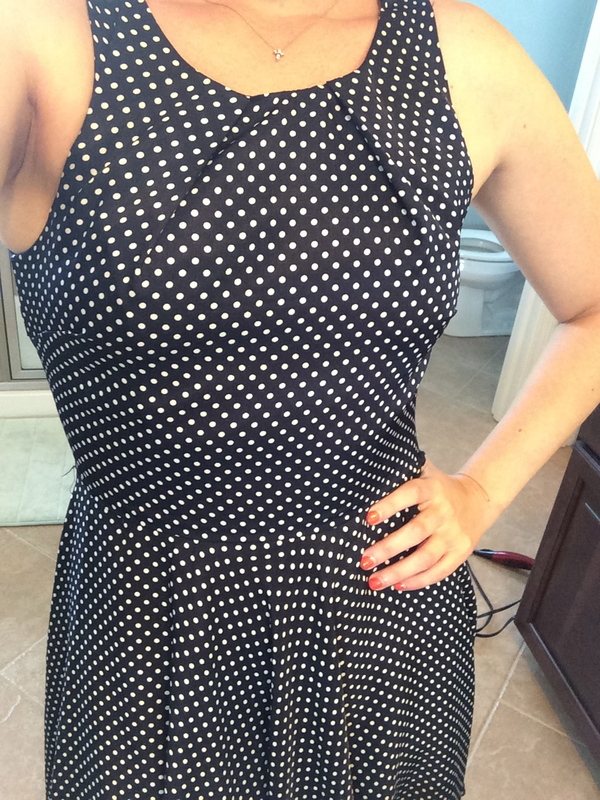 I don’t necessarily mind needing to hem things, but I didn’t like the print and overall the dress was not flattering enough to warrant the extra $20 needed for alterations. The tiered tank, I’m not going to lie, was terrible. Definitely not my style with all that extra material. However, it really was the only item in this fix that was completely out of the ballpark. 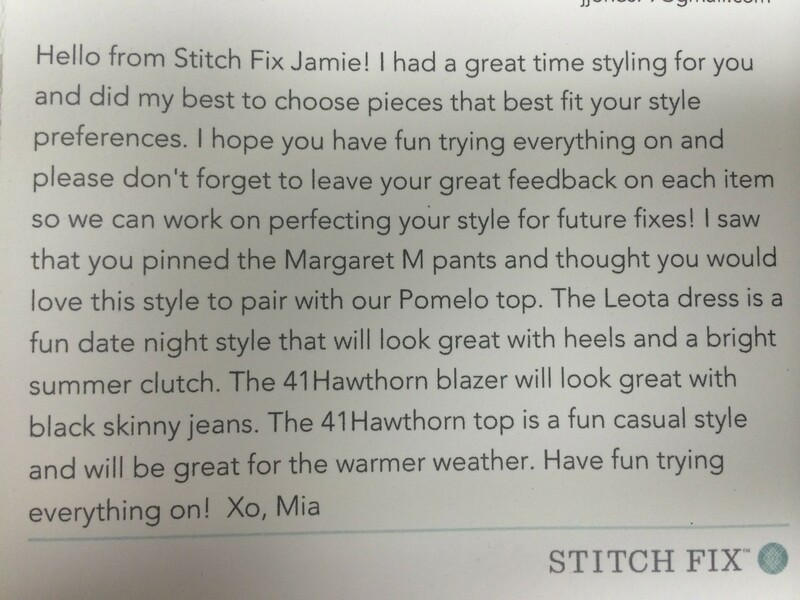 Overall Impression of Fix #4: Aaaahh, better, definitely better. 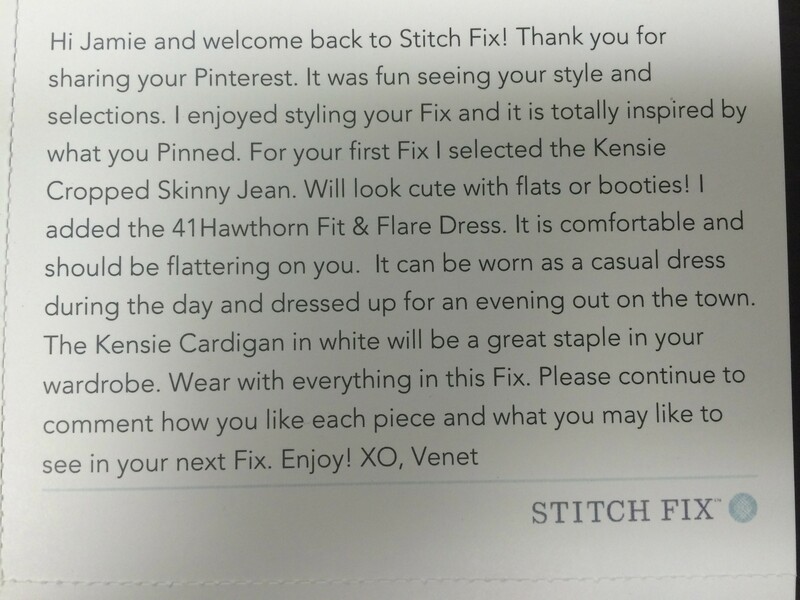 I only kept 2 items from this fix, but it was much much more in line with my actual style and has restored my faith in Stitch Fix. 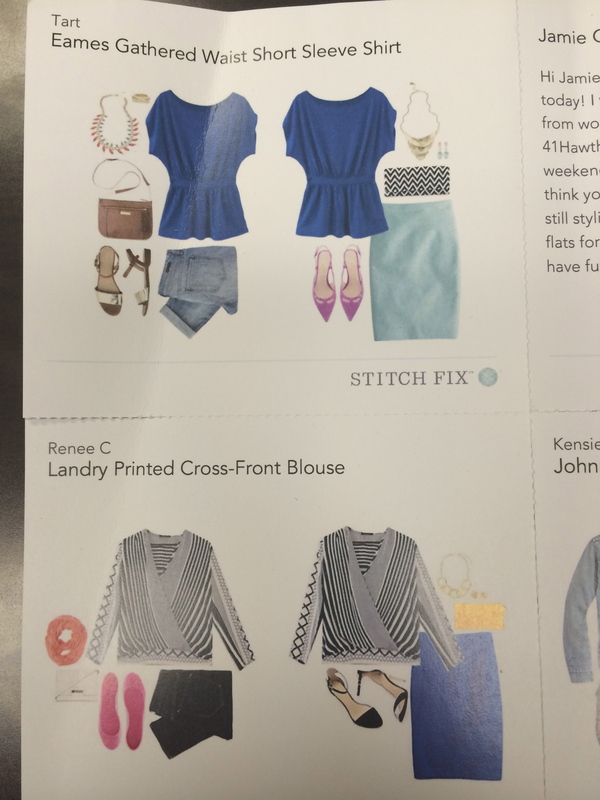 Stitch Fix is attempting to provide a personal styling service to a large number of women – different ages, different sizes, and different tastes. I have seen reviews from women in their 20’s to women in their 50’s. I do think that a large portion of their inventory is on the conservative side and they don’t tend to carry too many fitted pieces. Do I think they have my Olivia Palermo/Rachel Zoe style down yet? No, not really, but that being said, I like their price point, they have great basics, a nice mix of brands that aren’t available everywhere, and they have great customer service. I am already signed up for another fix next month. If you would like to sign up, click here, and you can start filling out your own style profile! 1. Start a Pinterest Page. 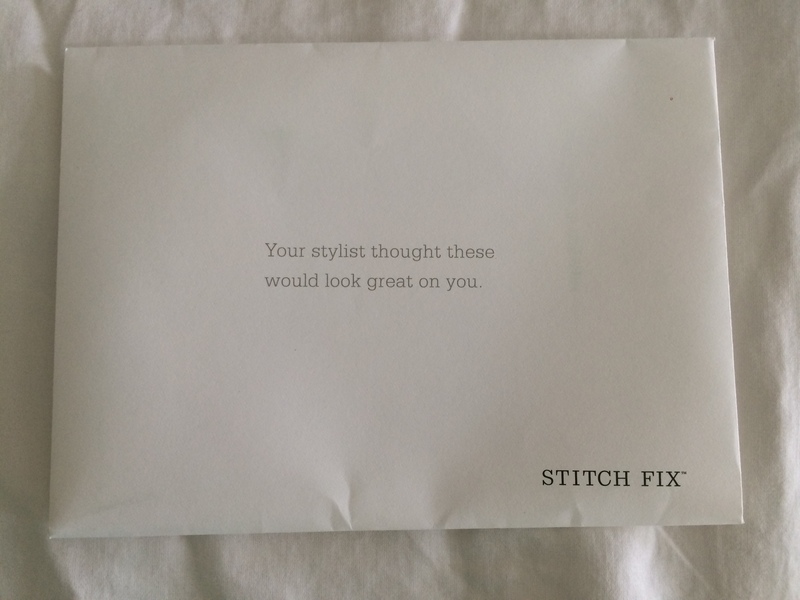 This is a huge help to the stylist, and you should include a picture of yourself on your profile. 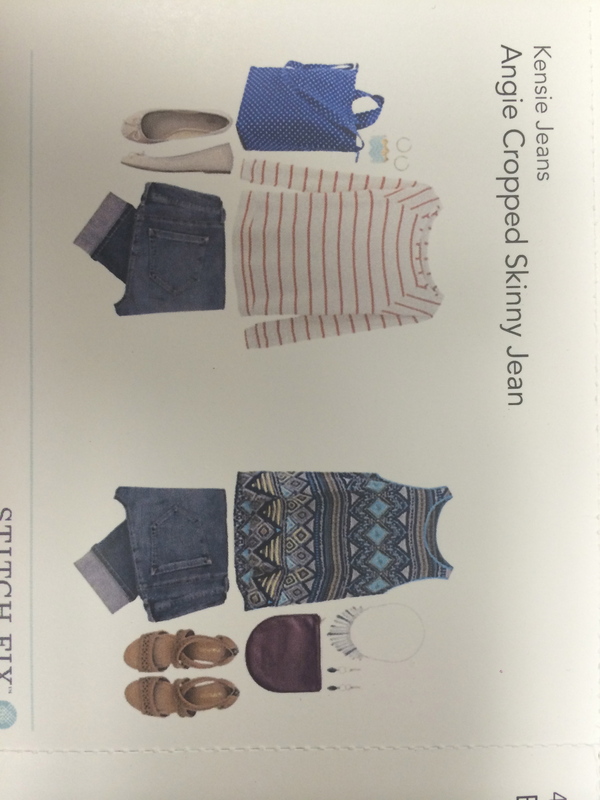 I can imagine that trying to style for someone you have never seen a picture of would be quite difficult. Here is my personal referral link to get started. Whenever you sign up, you are given a personal referral link and receive $25 in credit towards a purchase if anyone uses it. 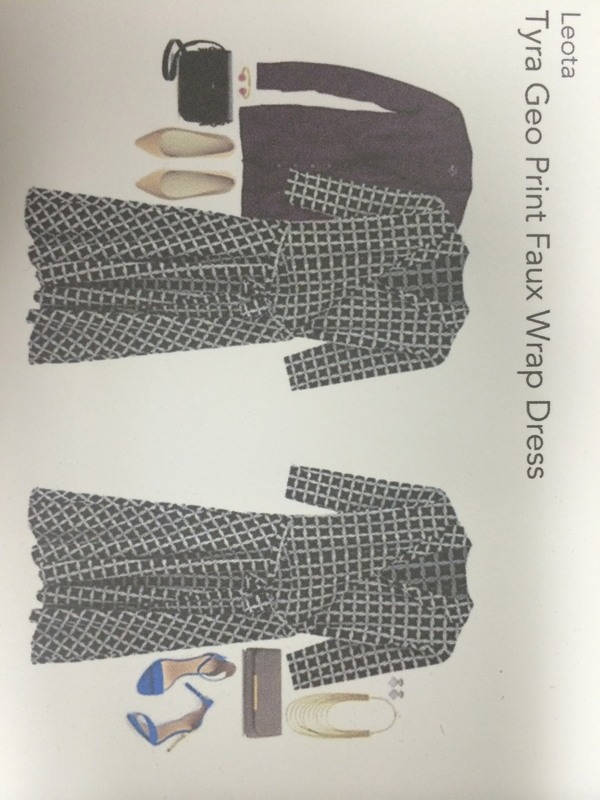 This entry was posted in Fashion and tagged 41 Hawthorn, Fashion, Fashionista, J. 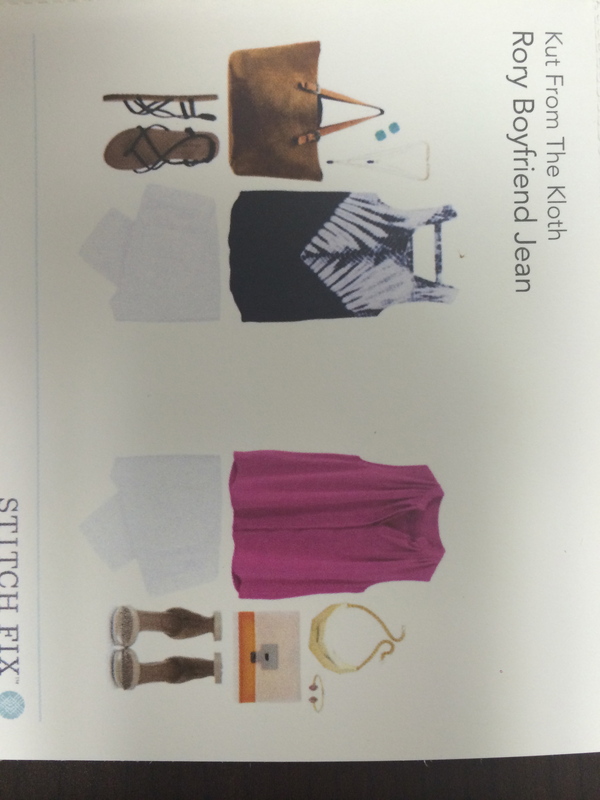 Crew, July 2014 Stitch Fix Review, Kensie Jeans, Kut from the Kloth, muffin top, Olivia Palermo, Pinterest, skinny jeans, Stitch Fix, Stitch Fix Review by surgeoninkicks. Bookmark the permalink. 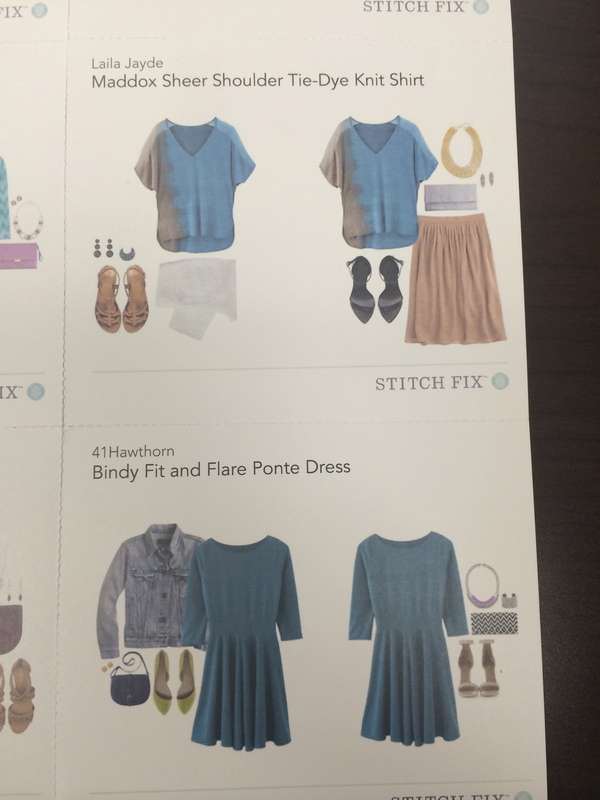 I just opted out of stitch fix after my 5th and 6th fixes were awful! They kept changing my stylist, so just when I thought someone was getting it right, I would get someone new! Although I loved getting the boxes, I think I am better off shopping myself! This sounds fun. Despite having a style blog, I don’t really enjoy shopping. The mall exhausts me so having someone mail me stuff to try on is definitely tempting… Thank you for the helpful review. I wonder if they ship to Canada?